Stop wasting money on throw-away zipper bags! Resealable, reusable food-grade silicone storage bags are here! Each bag can hold up to 4 cups of storage - and with an airtight, leakproof vacuum seal, you can store liquids and solids in these bags. They&apos;re great for freezing meats, or storing fruit for keeping. Also marinate your steak, or save your left over soup. Our Silicone Reusable bags are even great for sending the kids off with a snack! 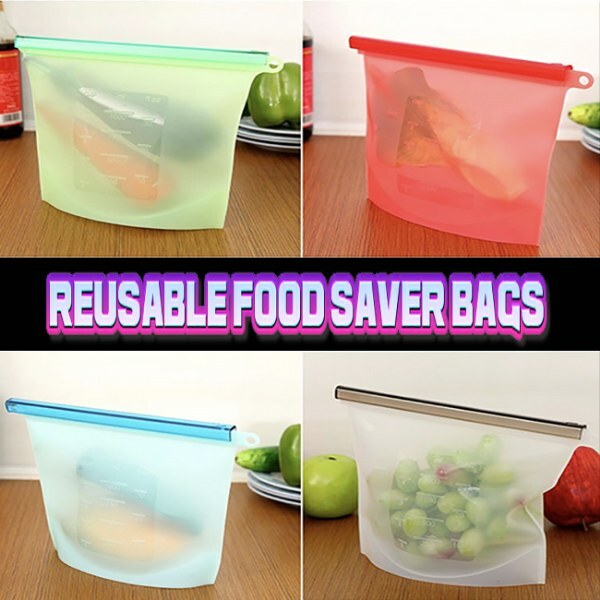 Silicone Reusable Food Saver Bags are made from 100% non-toxic, non-allergenic, environmentally safe silicone. These are produced to repel germs and chemicals, keeping your food safe. These bags can withstand heat up to 482� F to -58� F. Dishwasher and freezer safe.